Located on the western coast of Australia, Perth is a great location for travellers seeking a slightly different Australian experience. 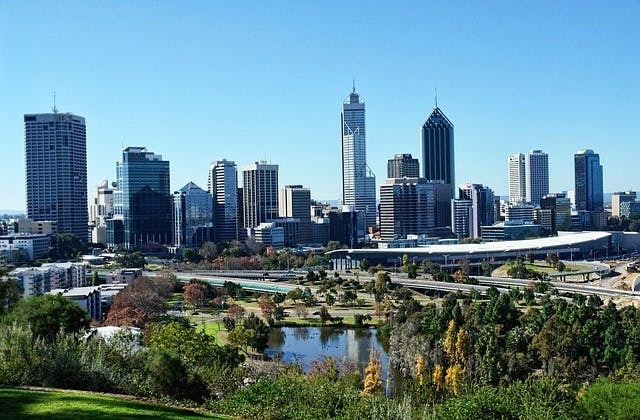 Perth is the capital of Western Australia as well as its largest city. While having a great coastal feel, Perth also has great dining options, hotels for every budget, and entertainment and fun for all types of travellers. Perth Airport is located 6 miles east of the city, operates with 52 airline providers, and offers non stop flights to 40 cities. The airport has both long and short term parking as well as taxis that are available at the domestic and international terminal. A taxi ride will take about 20 or 30 minutes and a one way trip will cost about AUD$40.00. Perth's CONNECT shuttle service operates to and from the domestic terminal and has 5 pick up spots in the city. Perth's transit system, Transperth, offers several services that make getting around Perth simple. Buses provide simple, efficient transportation to most everywhere in the city as well as some suburban destinations. There are also specialty bus lines that give service solely to high traffic areas of interest like universities, shopping centres, and attractions. However, Perth's city centre isn't large and one could easily get around on foot or, when necessary, taxis can be found easily and are not expensive. Perth offers a variety of hotel options but some parts of town may be better to stay in than others. For example, staying near Hay and Morgan St. will give you easy access to some of the better places to shop, whereas St. George's Terrace is the main street for banking and commerce. Northbridge is where you are more likely to find bars and loud backpackers so avoid this area if you wish to have quiet neighbours. Also, if you prefer the beach it's recommended you stay there, transportation to the beach areas can be hit or miss. The Perth Cultural Centre is where most of Perth's museums and art exhibits can be found. Perth is home to many museums, art galleries, theatre companies, and ballet companies that show the city of Perth's knack for the arts. Perth is also home to many arts and music festivals like Big Day Out, Soundwave, Perth Writers Festival, and the Winter Arts Festival which attract many each year. Due to its isolation, Perth has been able to nurture a talented local music scene while most bigger Australian bands stay on the east coast. Because of this, the nightlife in Perth offers many bars with live music of all types. Getting food in Perth is always a delight. Perth is home to restaurants for every budget and can cater to a variety of tastes. Due to its location on the Indian Ocean, Perth is home to world-class seafood that is prepared by some of the most renown chefs in Australia. Perth is also home to a immigrant population that has brought the food of their respective homelands with them, allowing everyone to find all sorts of food from Mexican, Mediterranean, Indian, Middle Eastern, and Asian cuisines. No matter what time of day, anyone can find a delicious meal while in Perth. Shopping in Perth can be just as exciting as eating in Perth with the city's many shopping centres that each provide their own charm and appeal. In any part of the city any traveller can stumble across small specialty stores, or you can find yourself in large, modern shopping complexes that have major retailers, department stores, and kiosks. The Carousel Shopping Centre is one of Perth's most largest and most popular shopping centres and could be an entire days worth of shopping. The Cockburn Gateway Shopping Centre is smaller and may be a little less crowded and is easy to get around. Waingapu in Indonesia is the closest international airport to Perth. The Coordinated Universal Time value for Perth is 28800. The closest hotel to Perth airport is The Airport Bed .